Polar Opposites Find Common Ground In Music For years, musical duos with a shared sensibility and strong opposing personalities have made hit after hit. Jerry Leiber and Mike Stoller, Doc Pomus and Mort Shuman, Mick Jagger and Keith Richards -- all of these teams have found a middle ground together. Jerry Leiber and Mike Stoller have written some tunes you might have heard, including "Hound Dog," "Love Potion No. 9" and "Yakety Yak." Though they've worked together for years, their relationship hasn't always been easy. "I can't remember if it's Mike or Jerry who describes their relationship as a 50-year-old argument," says David Ritz, who ghostwrote Leiber and Stoller's joint memoir. Ten years ago, the pair described that partnership on NPR as "long, long years of stepping on each other's words and toes and sentences." There's much that's similar about Leiber and Stoller: They were both Jewish kids who loved the blues and helped bring its rhythms into rock 'n' roll. But Leiber was the son of a single mother who ran a store in a poor black Baltimore neighborhood. As a kid, he delivered kerosene and coal, never learning how to read music. Stoller's family was more genteel: His aunt was a concert pianist. One brought street; one brought schooling. "Mike was able to take Jerry's wildness and not exactly tame it or cage it, but put some kind of frame around it," Ritz says, adding that a shared sensibility and strong opposing personalities was key to their success. "When chaos meets order, when anarchy meets discipline, it's always the yin and yang," he says. "I think tension is the key." That was absolutely the case with another pair of songwriters. Dave Stewart and Annie Lennox co-wrote some of the most shimmering hits of the 1980s as members of the band Eurythmics. They were also romantically involved -- and in the midst of a terrible fight when they wrote their most famous song, "Sweet Dreams (Are Made of This)." "It was a song that was written at a point where, personally, I almost felt I might have to head back to Scotland and just give up the ghost, as we say," Lennox says. "Dave very bravely carried on trying to write something on the drum machine. I think he programmed in the basic rhythm, and I was just about to leave the building, I think." Lennox's background was working class: Her father worked at a shipyard and her mother was a cook. But unlike the solidly middle-class Stewart, she had piano lessons and eventually won a scholarship to the Royal Academy of Music. Stewart's approach was instinctive. That same dynamic comes into play in dozens of the greatest songwriting teams. Doc Pomus and Mort Shuman are another example of this dynamic. As co-creator of the hits "Teenager in Love," "Hushabye" and "Viva Las Vegas," Pomus was a wild man whose leg braces -- a legacy from childhood polio -- did not stop him from singing at Harlem blues clubs as a white Jewish teenager. Shuman was conservatory-trained and orderly. He organized his partner's passions. Moving from Manhattan to the Motor City, Norman Whitfield spent his youth hustling in pool halls -- and at Motown. There, he became known as a temperamental experimentalist, obsessive and fearless. Barrett Strong was the stable force about whom less is written. Whitfield and Strong's string of hits enabled Motown to expand. Besides "I Heard It Through the Grapevine," the two wrote "Papa Was a Rolling Stone," "Ball of Confusion" and "War." Today's songwriting teams seem less volatile, Ritz says, perhaps because they're not trying to harness the volatility of a new form. The best songwriting teams in early R&B and rock 'n' roll, he says, required an Apollo and a Dionysus. "What better example, ultimately, than Mick and Keith? Jagger brought formal training, discipline and business acumen. Richards brought intense focus ... and a total lack of inhibition," Ritz says. 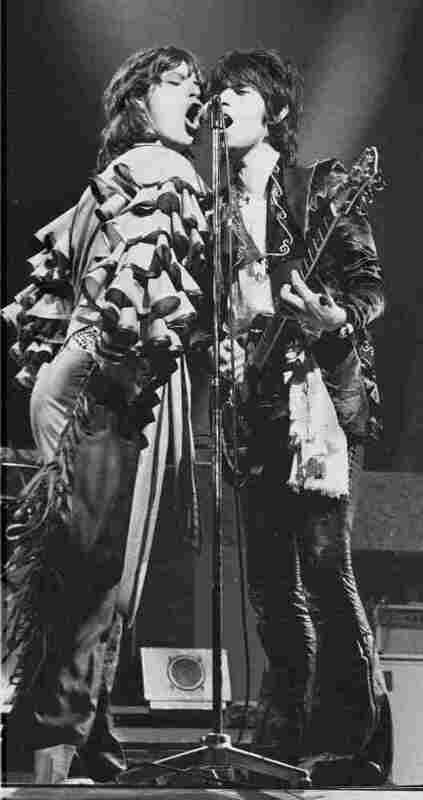 Richards is the Dionysian force, while Jagger seems more Apollonian by nature. "If Dionysus and Apollo can live together in a three-minute song," Ritz says, "you got a hell of a hit."